The newly launched 'Bhangra Ta Sajda' will be the ultimate sangeet anthem for your 2018 wedding! Just after I was recovering from #SonamKiShaadi hangover, the makers of film Veere Di Wedding released a new number - Bhangra Ta Sajda and they couldnt have aced the timing better (I wonder if this was all planned though :p). Believe me when I tell you, this will be the ultimate sangeet anthem for all of the 2018 Indian weddings. Also, it had been quite some time since there was a desi shaadi song released and the wait is finally over with Bhangra Ta Sajda! This song will have you humming to it’s tune and shaking your booty right from the very first verse for all the wedding functions be it yours or your BFF’s. What really caught my attention in the video were the outfits (not too surprising, is it?). Abu Jani Sandeep Khosla, you are totally giving some major #bridesmaidgoals to every girl out there! That’s because in spite of so many colours swirling in each frame, the designers found a way to capture the essence of the characters. 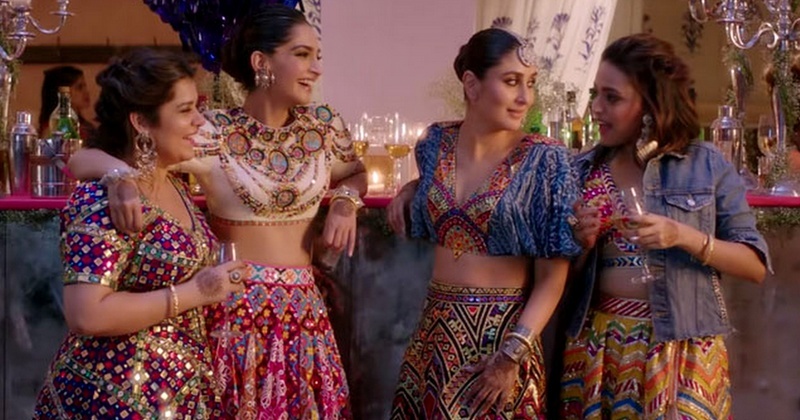 Kareena Kapoor Khan’s blouse features the printed-cropped bell sleeves while Sonam Kapoor’s has an ornate jewelled neckline. P.S., Kareena’s statement maang tikka is amaze! It goes without saying that I want them all for my BFF's upcoming shaadis. If you haven't heard it already, then it’s about time to give this one a listening and get ready to groove to Bhangra Ta Sajda from Veere Di Wedding with your BFF’s!